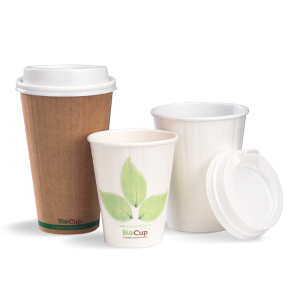 We carry a comprehensive range of paper takeaway cups to suit all budgets & tastes. Our single wall Cups are ideal for the price savvy consumer, whilst our ripple wave cups have a heat barrier to keep your hands cool. All of our disposable coffee cups are available with slotted lids for drinking on the run (LIDS SOLD SEPARATELY). In order to determine the style of cup to suit your business, the following factors should be considered: your budget, the nature of your establishment, any existing décor, & your target market. Our ripple wave paper cups will enhance your customers’ experience, & blend in seamlessly with the décor in most cafes. Our single wall coffee cups are also elegantly designed, but are more suitable where cost is the primary consideration. The next step is to find lids that fits securely on the Takeaway Coffee Cups to prevent spillages. Both styles are made to suit our takeaway coffee cups, & clip on securely. The “Sipper Lid” has a raised spout which facilitates a more controlled flow of coffee, whilst the “Traveler Lid” has a slot that is flush with the rim. The operation & performance of both sets of coffee cup lids is comparable – the ultimate decision depends on personal taste & customer preferences. Other coffee accessories that are suitable for use in all cafes include coffee cup trays, plastic cutlery & 1-ply paper luncheon napkins. Our ripple wave paper coffee cup is a triple wall cup that has been expertly designed to ensure that the outside of the cup is cool to hold, whilst the beverage remains hot. The solid construction means that the coffee cup won’t buckle or warp when filled with coffee, avoiding nasty spillages. Our take away coffee cups are biodegradable & 100% recyclable. The single wall coffee cup was once used universally throughout the industry, to the exclusion of other cups. 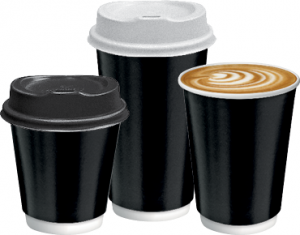 Nowadays, the double wall, triple wall & corrugated or ripple cups are equally as popular, however, the single wall cup still has an important role to play.It is the most cost effective paper coffee cup on the market & offers great value for a range of establishments, including cafes, coffee bars, cash wash outlets, service stations, & office tearooms.